"A superb rendition of the classic adage that life imitates art (and vice versa). The storyline of intertwining lives and loves, ambitions and friendships, is nothing short of operatic; the setting of high music provides an ideally fertile background to the dramatic events in the lives of the characters, who are invariably fascinating, relatable, and genuine; and the suspense—and there is plenty of it—leads up to the climactic performance that would determine our heroes’ future, delivering a wonderful conclusion—as realistic as if we were right there at the hall, watching the conductor as he “raised his baton high and gave the cue with full force, triggering the orchestra to play the majestic finale of the tragedy in fortissimo.” Bravo!" --Avraham Azrieli, The Columbia Review. 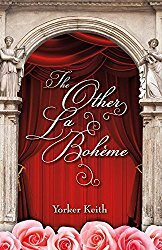 The Other La Bohème by Yorker Keith is a novel about four school friends who share (and pursue) an all-encompassing aspiration to success as opera singers in New York City. The title is rooted in Puccini’s famous opera, which they had performed together in school and in the “Other La Bohème” (by Leoncavallo), which they are to perform together as the story begins, as well as in the novel’s underlying dramatic theme and its wonderful tapestry of artistic passions, creative struggles, and ultimate redemption. The four friends, who are known artistically as the “Dolci Quattro,” are Jennifer (soprano), Stephanie (mezzo-soprano), Henry (tenor), and John (baritone). As the story begins, we share with them the excitement and tension of their coming, fateful performance. From there, the story develops richly and dramatically with their individual complex lives—broken hearts, family pressures, and the perennial performers’ twin maladies: perfectionism and self-doubts. In summary, The Other La Bohème by Yorker Keith is a superb rendition of the classic adage that life imitates art (and vice versa). The storyline of intertwining lives and loves, ambitions and friendships, is nothing short of operatic; the setting of high music provides an ideally fertile background to the dramatic events in the lives of the characters, who are invariably fascinating, relatable, and genuine; and the suspense—and there is plenty of it—leads up to the climactic performance that would determine our heroes’ future, delivering a wonderful conclusion—as realistic as if we were right there at the hall, watching the conductor as he “raised his baton high and gave the cue with full force, triggering the orchestra to play the majestic finale of the tragedy in fortissimo.” Bravo!